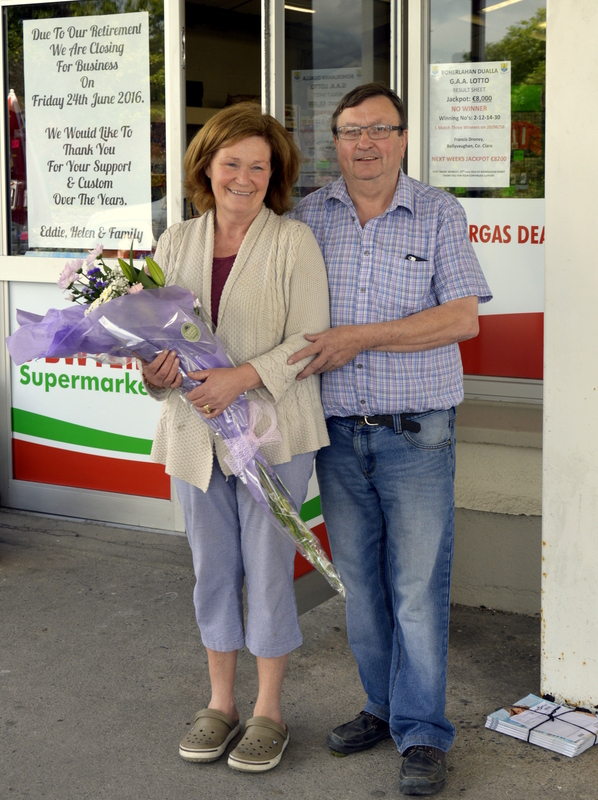 On Friday 24th June 2016, Eddie and Helen O’Dwyer closed the doors of their shop in Boherlahan village for the last time. It was a busy day for them as a constant stream of well wishers called in to express their good wishes and thanks. Eddie and Helen have provided an invaluable service to the community for very many years and are well entitled to enjoy a long and happy retirement. They are looking forward to having more time for themselves and they expressed their thanks that they are both in good health. Dinny Ryan, Eddie’s grandfather and a carpenter, built the original small shop for his daughter Kitty in 1945. She married Ned O’Dwyer, a native of Rossmore. Together they ran the business for many years as their family grew up. Petrol pumps were added in 1957, no doubt a great convenience for the increasing numbers of car owners at the time. But for many parishioners of a certain age their greatest memories will be of the “penny bars”, the “lucky bags”, the three-penny and six-penny wafers of ice cream, and other treats which were an essential part of any trip to the shop. Ned died in 1975, and Kitty in 2005. Their son Eddie took over the running of the shop in 1969, and shortly afterwards made two small extensions. Eddie and Helen were married in 1972. Then in July 1983 they commenced the most significant expansion of the business to date. The present large premises were moved into in 1984. This was a very major development. In the years since then they have sold a huge variety of goods. It would be impossible to list everything, but included are groceries, hardware, hill-walking gear, baby food, cars, bikes, welders and much more besides. Eddie and Helen want to thank the local community for their custom and support down the years, without which the business could not have continued. They also expressed their thanks to all the loyal and trustworthy staff who have worked for them. They are very grateful to their faithful suppliers as well. Indeed, they have been dealing with some of their suppliers for over forty years. They have made many friends among their customers, staff and suppliers. Eddie and Helen would ask the community to support any future successor business in the village of Boherlahan. This is essential to maintain the existence of a local shop. Having been at the heart of the community for 364 days a year for so long, there was a lonely look about the village on Sunday as the usual procession to the shop for the papers was no more. The school will also miss Helen’s lunches and the many other services provided. We send them our best wishes for the future.